Badu Gili – meaning ‘water light’ in the language of the traditional owners of Bennelong Point, the Gadigal people – is a new daily experience that will explore ancient First Nations stories in a spectacular seven-minute projection, illuminating the Opera House’s eastern Bennelong sail year-round at sunset and 7pm. A celebration of the rich history and contemporary vibrancy of Australia’s First Nations culture, Badu Gili continues the traditions of Bennelong Point, formerly known as Tubowgule, which has been a meeting place for the local Gadigal people for thousands of years. Curated by the Opera House’s Head of First Nations Programming, Rhoda Roberts AO, the projections weave together the work of five eminent First Nations artists from across Australia and the Torres Strait Islands, Jenuarrie (Judith Warrie), Frances Belle Parker, Alick Tipoti and the late Lin Onus and Minnie Pwerle. 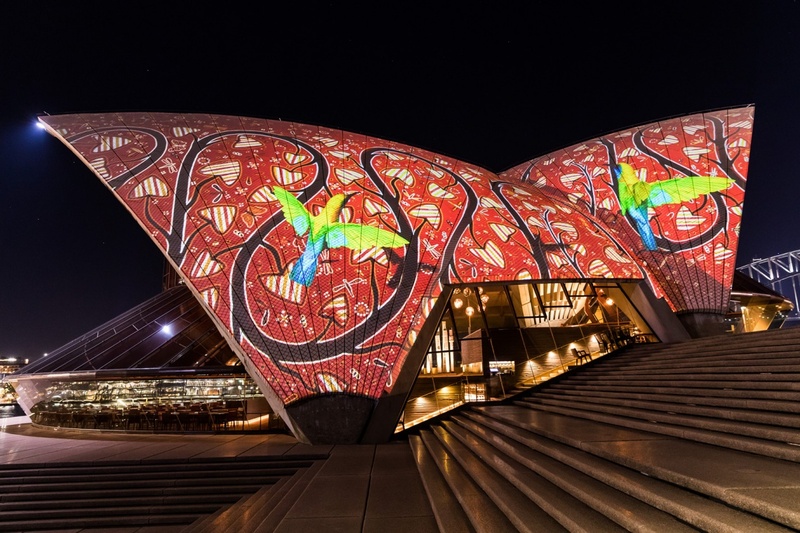 Badu Gili has been enabled by the Opera House, its Idealist donors and the Australia Council for the Arts.